The definitive guide to original components and parts interchangeability. An Essential Reference Book for all restorers of classic Minis! Includes detailed photos of rare parts. The Mini's long production life saw many model changes and literally thousands of component changes, making choosing and assessing the correct part for a classic Mini very difficult. 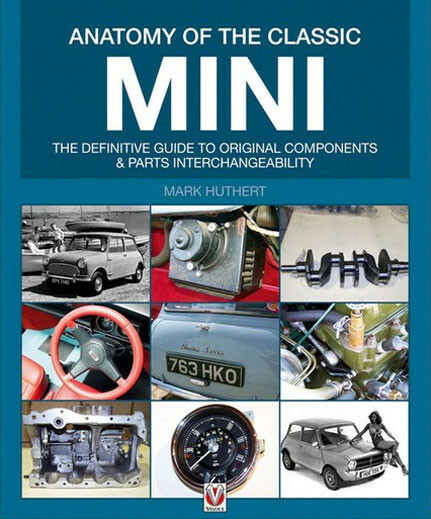 If you wish to keep your Classic Mini going, this book will enable you to look and assess other A-series parts from other cars. No books like this have been published before for the Classic Mini. This book is the result of years of research, and comprises around 1800 photos showing these component variations, with captions explaining which Mini model and date each component was originally designed to fit. With no German parts listed, this book is an essential volume for all restorers of the classic Mini looking for true authenticity. The purpose of this book is to enable the reader to identify important parts correctly , and help source replacements from other vehicles from the same manufactures , particularly engine and gearbox components.